The end of GM’s small-car mediocrity is breathlessly proclaimed with the launch of each new model – many of which have been disappointing, so we were initially skeptical about about the company’s latest subcompact savior: the 2012 Chevrolet Sonic. On paper, after all, this Sonic just looks like business as usual. Its base 1.8-liter engine is the same inefficient lump that powers (a generous term) the Cruze. Much of its engineering was handled by Daewoo, a Korean company that was purchased by GM in 2001 following an unsuccessful attempt to sell rattletraps to American college students. This is the car that’s supposed to change the way we think about affordable GM products? Ah, but then we drove one. And let’s be clear: we drove the top-of-the-line LTZ hatchback, which has a turbocharged 1.4-liter engine, stickers for $17,935, and only comes with a six-speed manual transmission as of this writing. In other words, we drove the Civic Si of Sonics—the sporty one that few mainstream consumers will buy. Still, we were gobsmacked by the LTZ’s fundamental goodness. It cruises confidently, handles deftly, accelerates eagerly, and sips fuel like an ’85 Tercel. Oh, and like every Sonic, it’s got one of the coolest instrument panels on the planet. So, does the Sonic herald a new era of small-car competitiveness for GM? We’ll withhold full judgment until Chevy sends us a 1.8-liter Sonic to test. As an illustration of the Sonic’s capabilities, though, the LTZ model is immensely promising. If the mass-market models live up to this promise, we’ll unreservedly add our voices to the pro-Sonic chorus. The LTZ’s turbocharged 1.4-liter inline-four isn’t especially powerful, but it provides a broad torque spread that makes slicing through traffic a breeze—and fuel economy is excellent. 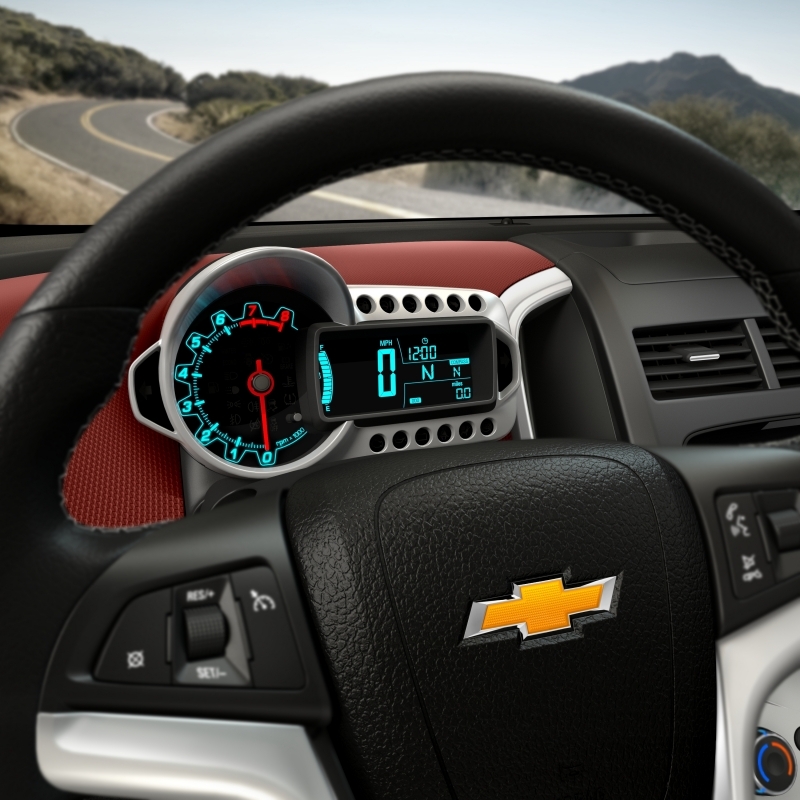 The LTZ hatchback has a real sense of style with its 17-inch wheels, and the standard digital instrument panel is a winner. The steering column has plenty of telescopic range for tall folks. Ride quality, noise suppression, and handling are all very good for this class. The “idiot lightâ€ for the high beams is piercingly bright at night. Materials and build quality were spotty on our tester. Tall front-seat occupants leave little legroom for passengers sitting behind them. Throttle response is seriously sleepy, and there’s no Sport button to wake it up. The first thing we noticed inside the Sonic was the high, deep dashboard, which made us feel like we were peering out of a bunker. 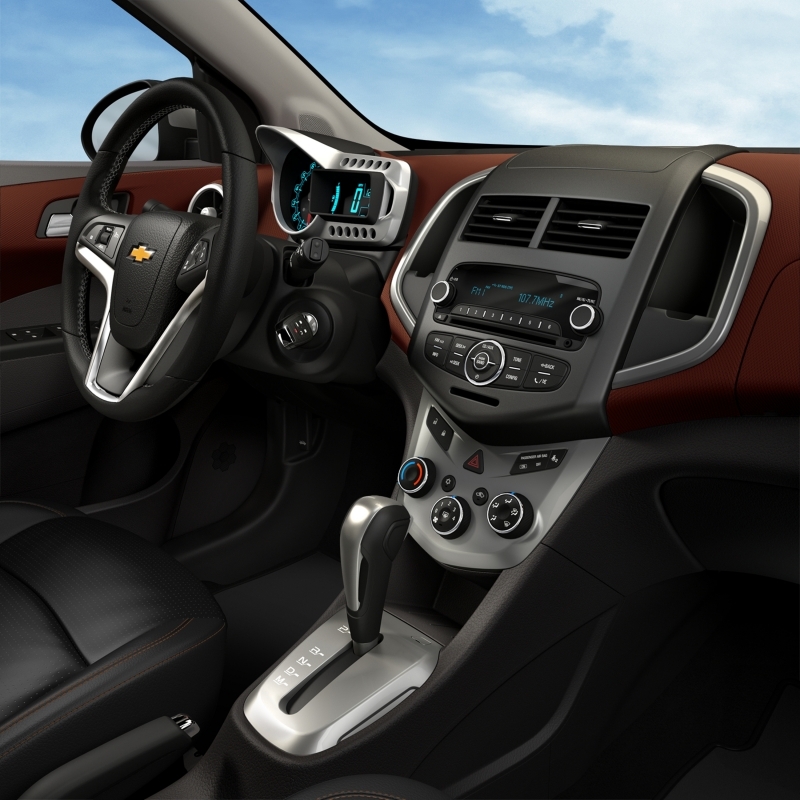 Fortunately, the LTZ’s driver seat comes with a standard height adjuster, and even tall drivers were able to jack the seat up considerably without encountering headroom issues. The generously telescoping steering column was also well-received and in stark contrast to the Toyota Yaris’s non-telescoping setup, for example. At highway speeds, the Sonic is remarkably quiet for a car of this size and price; the Honda Fit is a torturous echo-chamber by comparison. Even with those big 17-inch wheels, ride quality is just fine unless you hit some serious ruts, in which case the suspension may meet the bump-stops with a harsh, gunshot-like whap! On winding roads, the Sonic LTZ is one of the most entertaining cars under $20,000, evincing well-controlled body motions and unusually sharp steering responses. 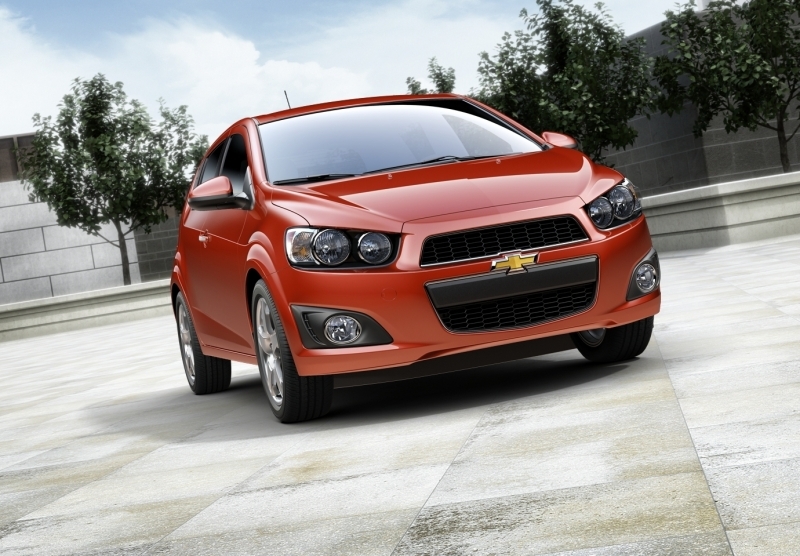 The 2012 Chevrolet Sonic LTZ boasts a turbocharged 1.4-liter inline-four rated at 138 horsepower and 148 pound-feet of torque. Currently, the sole transmission is a six-speed manual, whose long but light and precise throws we generally enjoyed. We found the turbo’s operation lumpy at times—shifting from first to second at moderate engine speeds often resulted in a dramatic power cut, so we started staying in first longer to compensate, which obviously doesn’t help fuel economy. The sluggish throttle response doesn’t help, either; this car seriously needs a Sport button a la the Mini Cooper. 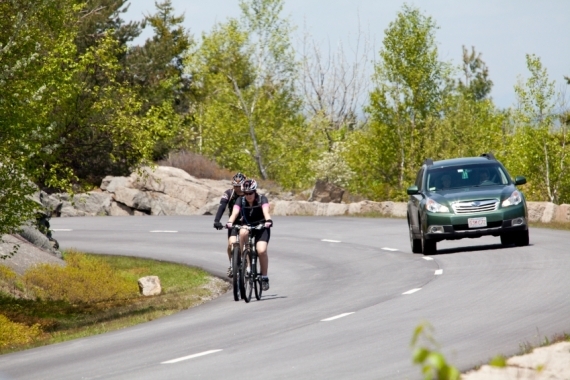 But as long as you keep the motor above 2,500 rpm or so, there’s a nice fat slab of torque that sticks around all the way to 6,000 rpm, making passing and merging on the highway a drama-free affair. We’d only ask for a bit more engine refinement at the top end, as the ordinarily demure 1.4 starts getting boomy around 4,500 rpm, right when the turbo’s in full stride. 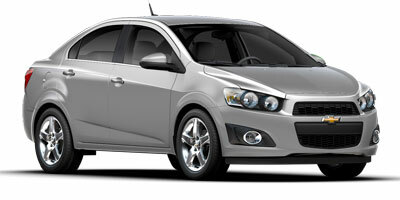 The 2012 Chevrolet Sonic LTZ is EPA-rated at 29 miles per gallon city, 40 mpg highway, and 33 mpg combined. These are great numbers, especially in light of the LTZ’s spirited performance. The Sonic LTZ comes standard with USB connectivity, and we had no issues navigating through folders and selecting mp3s on our standard 16-gigabyte flash drive. At first we thought that the six-speaker audio system was pathetic, but then we realized that the sound quality is adequate if you crank the bass up to +10—which incidentally makes us wonder about the long-term durability of the speakers. Bluetooth for phone and streaming audio is standard, too, as are heated seats, air conditioning, cruise control, three free months of Sirius satellite radio, and six free months of GM’s OnStar telematics system. You pay a lot upfront for the LTZ by subcompact standards, but you get a lot of feature content in return. Let’s start with the good news: the Sonic’s motorcycle-inspired instrument panel is one of our favorite interior features in any car. The enormous digital speedometer is wonderfully crisp and clear, and the whole right side of the panel reminds us of one of those fancy alarm clocks from A Sharper Image. The left side is an analog tachometer, which also looks great and actually happens to be relevant in manual-transmission Sonics. The rest of the interior, however, is just average by segment standards, and if you feel around the center tunnel, you’ll encounter various sharp edges and loose fitments. Furthermore, the 60/40-split rear seatbacks were misaligned in our test car—the “40â€ was a half-inch lower than the “60â€ at their junction. Seat comfort in front is adequate, but we’d like to see more lateral support in such a sharp-handling car, and an adjustable driver lumbar support would be nice. The backseat comes up aces in headroom and thigh support, but rear passengers had better hope that the folks in front don’t have long legs. Cargo space, measuring 19 cubic feet behind the backseat and 30.7 cubic feet with the rear seatbacks folded down, puts the Sonic about even with the Ford Fiesta but way behind the flexible Fit in terms of hauling ability. No complaints here. The Sonic’s aggressive nose recalls the eponymous video-game character, and the LTZ model’s 17-inch alloys really tie the whole package together. It’s a subcompact that looks fun, not cheap. The Sonic LTZ hatchback undercuts the base Mini Cooper by a healthy price margin, and we think the Chevy is a viable Mini substitute, which is very high praise. The Fiat 500 is another stylish subcompact in this price range, but it’s generally outclassed by the Sonic. 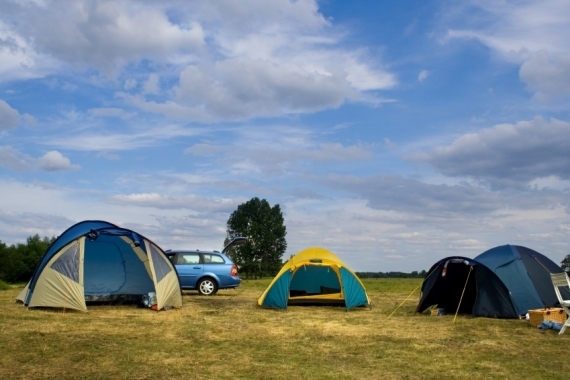 We’d encourage you to look at the similar Ford Fiesta hatchback, and also the larger Ford Focus hatchback, which might be available for about the same money. 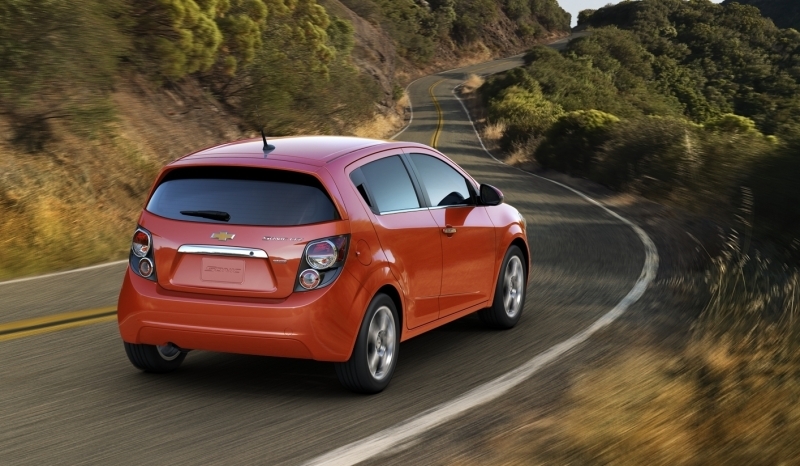 As subcompacts go, though, the Sonic LTZ is about as good as it gets for under $20,000. Alright, GM, you’ve got our attention. Now build a Sonic for the masses—automatic transmission, lower price point—that will make the LTZ proud.